This nog will please even those who say they don't like soymilk. It's not too thick and cloying, makes a refreshing drink any time of the year. Make the eggnog mix ahead of time, then blend with the ice cubes just before serving. 2 cup reduced-fat soymilk, or other plain, non-dairy "milk"
Place the crumbled tofu and the soymilk in a blender with the sugar and salt. Blend until very smooth. Scrape this into a large bowl or pitcher, and whisk in the water, rum or brandy, and vanilla. Mix well, cover, and refrigerate until serving time. To serve, blend half of the mixture in the blender with 10 of the ice cubes until frothy. Repeat with the other half. Serve in glasses with nutmeg sprinkled on top. 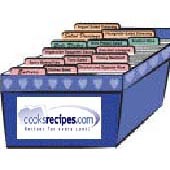 Recipe Source: The Almost No-Fat Holiday Cookbook.